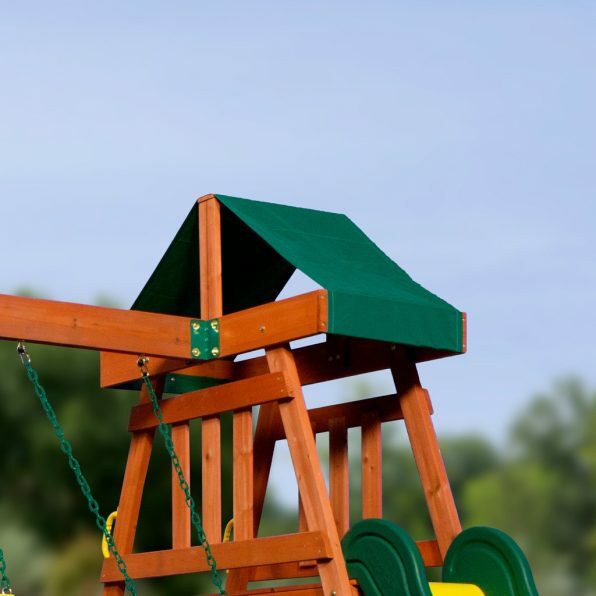 The Prescott Cedar swing set by Backyard Discovery is a wonderfully affordable swing set that will lead to lots of play and adventures. 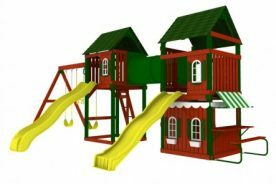 It is filled with climbing, swinging, digging fun and is the perfect size for smaller families and families with small to medium-sized yards. 6 Should I Buy It? 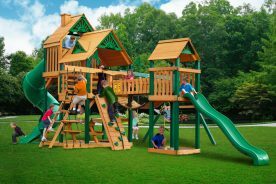 If you are looking for a small swing set with all the standard features and benefits of a wood swing set the Prescott is a great option. The most exciting part of the swing set is the canopy-covered club house. The upper deck measures 49 inches by 22 inches and is 4 feet off the ground. That’s a good size for a couple kids to hang out before zooming down the super speedy 8 foot long slide. The club house is accessed by a ladder with wooden slates. The ladder doubles as a rock wall for an extra challenge. The area under the clubhouse can be used as an optional sandbox and will hold up to 5 cubic feet of sand. That is the perfect out-of-the-way area for a sand box. The swing beam is attached to the clubhouse and is about 7 feet off the ground. Two belt swings and a trapeze bar hang from the swing beam for awesome swinging fun. The Prescott has a neat safety feature in that the frame is angled for maximum stability. It’s nice to the swing set won’t start rocking when the kids are swinging. The recommended limit of kids on the swing set is 5 at once weighing a maximum of 120 pounds each. The Prescott is made entirely of cedar wood which is naturally resistant to rot, decay, and insects. The wood comes pre-cut and pre-drilled. The wood is naturally chemical-free and is stained with a water-based top coat for appearances. It is recommended you re-stain your swing set annually to protect the wood and keep it in its best condition. This is a requirement of the warranty covering the swing set. 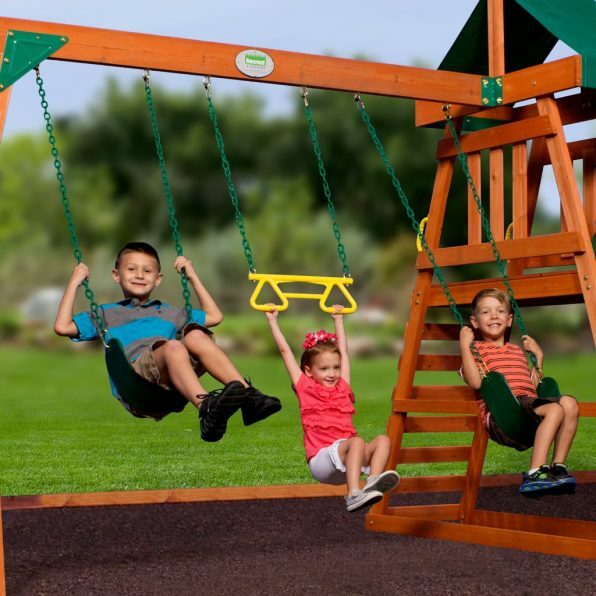 The Prescott is a good small-size swing set with dimensions of 11 feet and 2 inches in length, 11 feet and 7 inches in width, and 8 feet and 2 inches at the tallest point, which is the canopy. The weight of all the parts is around 200 pounds. This is something to keep in mind if you plan on buying the set at a store and transporting it home. 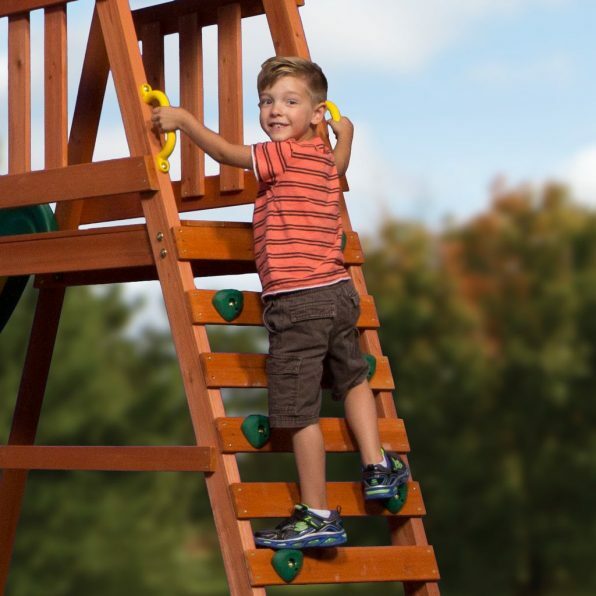 When setting up your swing set you’ll want to set up a six foot safety zone around the swing set. That mean all obstacles and structures should be no closer than six feet from any part of the swing set. Structures and obstacles would include your house, barn, garage, shed, porch, trees, clothesline, or powerlines. You will also want to consider the surfacing of your play area. It is not recommended you set up the swing set on concrete, packed earth or any other hard surface. To reduce the chances of injuries caused by falls you’ll want to add loose surfacing such under your swing set and around it extending to the safety zone. Examples of materials that are good shock absorbers are mulch, shredded tires, sand, wood chips or fine gravel. 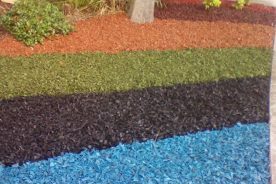 To learn more about your surfacing options read our tips here. All Backyard Discovery swing sets come with very instruction manuals. Included in the manuals are instructions with every step illustrated, maintenance information, frequently asked questions, and warranty information. 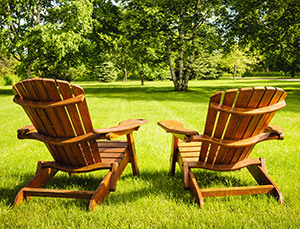 Check out the manual for the Prescott Cedar Swing Set here. Using the included instruction manual you can expect two adults to assemble the swing set in 6-8 hours. You will need a few tools such as hammer, level, drill, and tape measure. In order for your swing set to last a long time you’ll want to be sure to take good care of it. The most important thing to do is to apply stain or sealer to the wood at least once a year. Depending on where you live you may need to do this more than once a year. The stain will protect the wood and decrease the chance of rot and decay. Before you stain the wood it is a good idea to sand any splinters you may find. At the end of the play season, or when the temperature begins to drop below freezing you will want to remove your swings, trapeze, and canopy. These will last longer if they are store indoors or in the garage out of the elements of cold weather. You can replace these the following spring when it begins to warm up. When you replace the swings at the beginning of the play season you will also want to check and tighten all hardware. Moving metallic parts, such as the swings and trapeze bar should be lubricated to prevent rubbing. The protective covers of bolts, edges, pipes, and corners should be checked and tightened if loose. If any moving parts have rust or deterioration you’ll want replace these. If you any metallic parts have rust you should sand this off and re-paint. Twice a month during the play season be sure to check the hardware and tighten if loose, lubricate the moving parts, and check all moving parts for deterioration. Check the depth of the surfacing material at the beginning and end of each play season and once a month during play. Rake the material so it doesn’t become compacted and add more if needed to reach the desired depth. All Backyard Discovery swing sets come with a limited warranty. All parts are covered for up to one year against defects. The wood in the swing set is covered for up to five years. 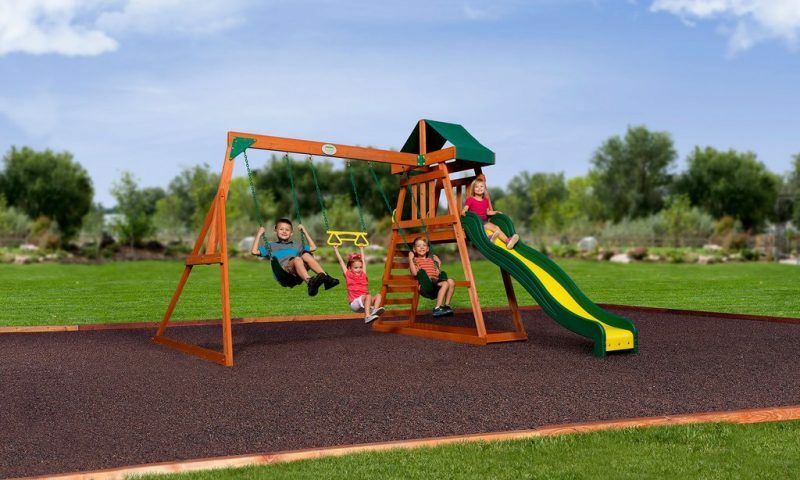 The Prescott Cedar Swing Set is a great choice for families with small yards. There is plenty of fun to be had on the swings, clubhouse, sandbox, and trapeze. 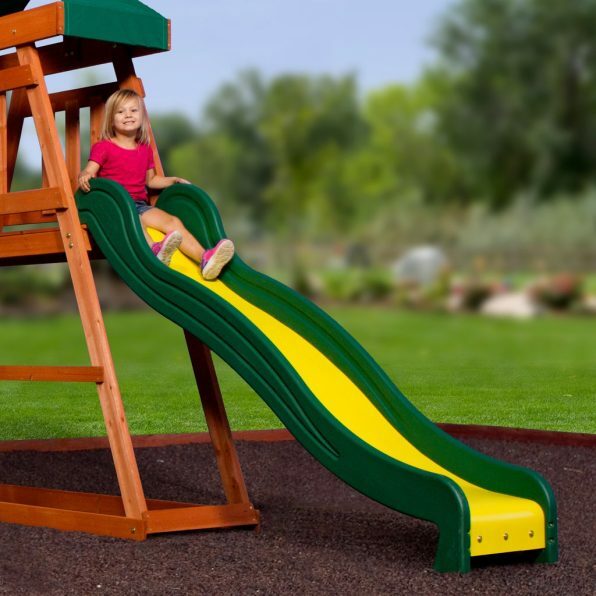 The fun never stops as kids zoom down the slide, swing to the moon, hold secret meetings in the clubhouse, and build award-worthy sand castles.